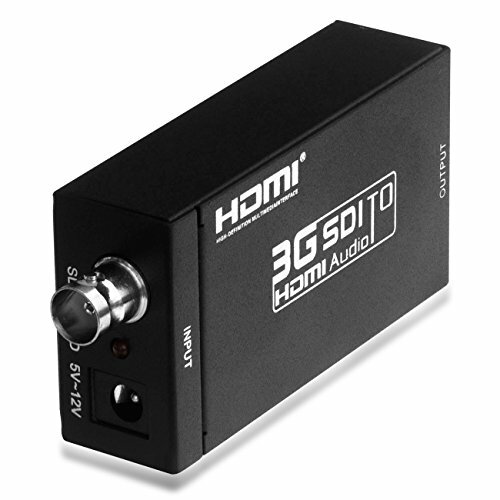 The Mini SDI to HDMI converter allows SD-SDI, HD-SDI and 3G-SDI signals to be shown on HDMI displays while ensuring high bit rates of 2.970 Gbit/s to give you fast signal transmission without any loss. 1. Complies with SMPTE 425M, SMPTE 424M, SMPTE 292M, SMPTE 259M-C. Conversion from SMPTE 425M level B to Level A 1080p 50/59.94/60 4:2:2 10-bit. 2. Adaptive scaler&TrueColor technology ensure video signal quality and display effection. 5. Supports wide range input voltage from 5V - 18V. 6. Mini size design easy to carry for engineering. ☞【Metal Housing Sturdy and Durable】 Fully Protected, Anti-interference, Cooling System. We Promise: 24-Hour Customer Email Technical Support, 30-Day Money Back Guarantee, and 12-Month Warranty.